Q. What is your background and training in creative writing? A. Before A DISCOVERY OF WITCHES, the last creative writing I did was in Mrs. Little’s 10th Grade English class at Hatboro-Horsham Senior High School. I wrote a short story (very short…) about a young girl’s first day in the New World. That’s it. Q. How many languages do you speak and how many are you fluent or able to work in? A. Here is my deceptively impressive list: French, Latin, Old English, Middle English, Italian, and Spanish. I have a smattering of Portuguese, Dutch, and Czech. But all of this knowledge is reading only—don’t ask me to speak any of them because I have a terrible speaking ability! Q. How do you balance your time and energy between teaching and writing and life? A. Some days I balance them better than others! I try to take things one day at a time. Eating right, exercising, and sleeping 7+ hours a night help. Q. If you could travel through time, when and where would you go? A. 1590. But you knew that already. Q. What’s the best part about being a novelist? A. Talking to readers about the books. Seriously. Writing is hard! Q. When you’re going about your life, do you see people that you tag/identify as a witch or another creature? A. Yes. When I’m standing in the line at the grocery store, or during intermission at the LA Phil, or watching TV—I do it all the time. Q. When you’re not writing or teaching, what are you reading? A. Either 16th-century primary sources or works of academic history. This week I am reading the last letters of Sir Thomas More, an article of gifts of clothing in Tudor England, and the prayers of Elizabeth I.
Q. How do you research the science in your books? A. I read current scientific journals and books, and I talk to scientists in the field to make sure that my use of language and terms is right—as well as the concepts themselves. Q. Do you believe in magic? Q. What is your research process? A. This is a difficult question to answer, because I don’t really have a “process.” I’ve been a full-time historian, researching and teaching, since 1988 when I went to graduate school. So I do research every day. Sometimes it finds its way into my novels. Q. Did any of your characters surprise you? A. Yes. Hamish and Gallowglass surprised me simply by showing up! I had no plans in the books for either character. Q. Which of the three books is your favorite? A. 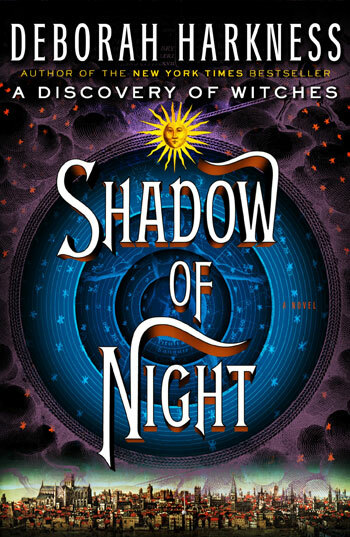 Shadow of Night—because I am a historian, and the 1590s are my area of specialty. Q. How do you picture Diana looking once she has absorbed THE BOOK OF LIFE? A. Like a human palimpsest, with strange shadows and images sometimes appearing on her skin, then disappearing. Q. How the heck do you pronunce Ysabeau? Q. Will Diana have a normal life expectancy or do weavers have longer life spans than normal witches? A. Weavers do not have longer life spans than normal witches–or normal humans, for that matter. Q. What is it like to be on book tour? Q. Who was the hardest character to write, and why? Q. Do you have any connection to the Madison NY area? A. Yes. My first full-time teaching job was at Colgate University in nearby Hamilton, NY. Q. Every writer has a different process for writing fiction. For example, free writing, outlines, writing different chapters out of order and connecting them. What is your process? A. I am not an outliner, but I do write in order. I had a general sense of the plot arc of the story, and write my way from A to B to C.
Q. I want to read the books in the All Souls Trilogy in order, from first to last. Where do I start (and end)? A. 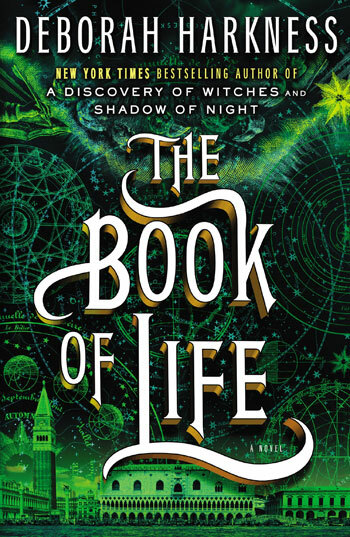 The first book is A DISCOVERY OF WITCHES, the second one is SHADOW OF NIGHT, and the third and final book in the trilogy is THE BOOK OF LIFE. Q. I don’t live in the U.S. How can I find out if and when your books will be available in my country? A. As foreign rights to my books are sold, we post them here on this website. Q. 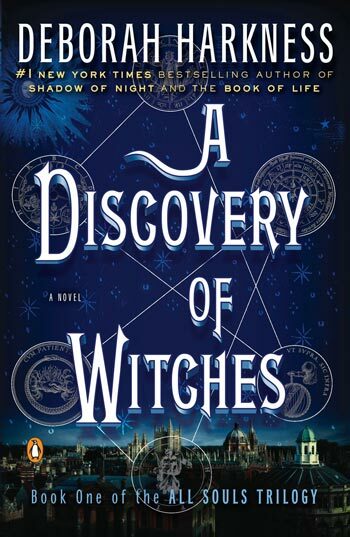 Why isn’t there a mass market paperback edition of A DISCOVERY OF WITCHES in the US? A. The publishers decide when and if there will be a mass-market paperback. Currently, there are hardback, audio, electronic, large print, and trade paperback edition. If a mass-market edition is planned for the US, I will let you know in the news updates. Q. Did you know the end of the book when you started? A. I knew the end of Diana and Matthew’s story very soon after I started. I wrote the first three lines (“it begins with absence and desire…”) first: that was my outline. Then I wrote chapter one of A DISCOVERY OF WITCHES. Then I wrote the final chapter of THE BOOK OF LIFE. Q. Where do the characters come from? A. If I ever figure that out, I’ll let you know! Q. Who is your favorite character in A DISCOVERY OF WITCHES? A. Yes. I never disagree with Albert Einstein. Q. Do you believe there are witches and vampires in the world? A. Absolutely. They’re not always known as witches and vampires, though. Q. Do you see yourself in Diana? A. I would like to think we can all see something of ourselves in Diana. Q. How did you research the book? How long did it take you? A. I’ve been studying European history between 1400 and 1800 since 1982. I have lots of notes. Q. Where did the idea to write the book come from? A. From a vacation in Puerto Vallarta, where I walked through the airport and saw all the books about witches and vampires on the shelves. This made me wonder if there really are witches and vampires, what do they do for a living? Q. What made you decide to make Satu a Finn? A. Members of my family and close circle of friends are Finnish. Besides, Satu means ‘fairytale.’ Who could resist naming a witch ‘Fairytale’? Q. Do you know that AB- is not the universal blood acceptor? That would be AB+. A. Yes, I do know that. I can even track the moment in the writing process when I transposed the bloodtype from my notes to the computer and reversed it. I didn’t catch it. No one caught it. Except for the hundreds of nurses and medical professionals who read the book, brought it to my attention, and got me to correct it. If you have a later printing of A Discovery of Witches, or the paperback, it will be correct in your copy. Thanks to all of you who let me know that it was wrong. Q. How did you learn about the ancient language of Occitan? A. I’m pretty sure I first encountered it as an undergraduate in a medieval literature course, then again as a graduate student. Q. Why the Knights of Lazarus? Where can I learn more about them? A. They are the least-understood medieval crusading order. Very little is known about them. That’s why they were irresistible. Q. Where did the inspiration of a vampire that does yoga come from? A. I was in a yoga class trying to do downward dog and while upside down I spotted someone who seemed to be balancing on a bit of their forearm and their ear. Obviously that person was not human. Q. Why is Diana so independent? Why is Diana so dependent (on Matthew)? A. Different perspectives are a beautiful thing, yes? I put these two questions together—the most often asked about Diana—just to show you that independence, like beauty, is in the eye of the beholder. Q. How would you classify the novel? A. Fiction. Plain old fiction. Q. How do you plot the book? A. Through a combination of careful planning and complete accident. Q. How do you handle the complicated backstories? Q. What chapters of A DISCOVERY OF WITCHES were the hardest to write? A. The chapters when Matthew abandoned Diana at Sept-Tours. Q. Does it feel like your characters are real? Q. How long did it take to write A DISCOVERY OF WITCHES? A. I wrote the book in nine months and revised it for submission over the course of three months. Then I spent a further six months editing the book for publication. Q. How did you feel when you were done with A DISCOVERY OF WITCHES? Q. Who would you like to see play Diana and Matthew? A. Imagine for a moment you are the actor cast to play Matthew, and in your first interview you are asked ‘how do you feel about the fact that Deborah Harkness saw X as Matthew and not you?’ If you can imagine that, you can imagine why I’m not going to tell you! A. I DID row. I was in the Keble College Oxford Novice, 2nd Eight, and 1stEight. I was also invited to be on the Women’s Blue Boat Development Squad but had to decline so I could finish my doctoral dissertation! I am a port/stroke side rower, and sat at various times in seat numbers 6, 4, and 2. A. I do ride. I rode as both an undergraduate and graduate and, after a twenty-year hiatus, recently started again. I began in hunter/jumper and progressed on to dressage. Q. Do you do yoga? A. Yes. I have practiced Iyengar, Anusara, and Vinyasa Flow. Q. How important is music to your creative process? Q. How autobiographical is the book? A. Every character has a bit of me in them, and many of them do something I enjoy doing or have done—cooking, rowing, riding, etc. But the book is NOT autobiographical. It’s fiction. Q. Has the success of A DISCOVERY OF WITCHES surprised you? A. Yes. Who is prepared for success like that? It’s been an amazing and humbling experience. Q. How has the success of A DISCOVERY OF WITCHES changed your life? Your writing? A. It’s not the success that’s changed things so much as becoming a novelist has changed things. I find it harder to read fiction, almost impossible to sit through a movie, and never watch TV (though I dearly loved TV before). As for the writing, it’s not the success but the fact that I know there is now an audience for the books that makes it feel different. When I sit at the computer, it’s as though you are all there reading over my shoulder. A few minutes into the writing, though, I forget you’re there! Q. What is your favorite historical time period? Q. What are your essential writing snacks? A. Edamame, Clif Mojo Bars, cashews, and almonds. And I drink lots of tea and water, some wine, and the occasional cappuccino. Q. Did you live in Oxford? A. Yes. I spent the summer there in 1985, and lived there between 1991 and 1993. Q. Can you sign my book? Can I purchase a signed book from you? A. I cannot sign your book unless I see you at a bookstore visit or you purchase a signed book in advance from a bookseller with a scheduled tour visit (see my Calendar for scheduled events or book tours). Bookstore policies vary with respect to advance orders, shipping, and when I am on tour, my books can often be purchased/signed/personalized. Our friends at Pages Bookstore in Manhattan Beach California are sometimes able to fulfill signed book orders for those of you who would like a signed/personalized copy of the US edition. Please see the detailed information here for more information. Q. If I come to a book signing event, is it okay to request a photo with the author? A. Absolutely. I’m happy to have my picture taken with you—singly, with book groups, etc.